Isn’t it time you stopped and smelled the bluebonnets? Chappell Hill’s Bluebonnet House & Garden Center, a nursery and store featuring everything from unusual plants to ceramics. Most Houstonians know Chappell Hill, if they know it at all, for its sausage and its misspelled town name and its thoroughly annoying traffic light. (You know the light I mean—the one on Hwy. 290 just past the Brazos River, the one you’re always running so you can make it to Brenham a few minutes earlier.) This was once the extent of my knowledge too, but that was before the ’90s, when my parents bought a dozen-acre property in Chappell Hill. There, in a little unincorporated town of 2,000-plus, they proceeded to channel Green Acres, install gas and electricity, dig a well, build a barn, and generally construct their life-after-Houston, with my brothers and me serving as free labor during weekends home from college. We watched as they whizzed past, car after car of city folk, as oblivious to the glories of our little hamlet as we ourselves had been. Named for Robert Wooding Chappell, town founder Mary Hargrove Haller's grandfather, Chappell Hill first sprang to life in 1847. After selling a hundred acres of home plots, Haller established a post office, invited Methodist missionary Robert Alexander to start a church, and watched her community swell to nearly 3,000 souls. Many of the first residents were Polish, give or take a few Czechs and Germans, which set the stage for what would become the town’s signature: its food. Not far from the banks of the Brazos River sits a large, oblong building with a large sign plastered above the doorway. The sign reads CHAPPELL HILL SAUSAGE, the address is 4255 Sausage Lane, and the family-run business is quite simply sausage heaven. It supplies the whole region with cylindrical meat smoked five ways from Sunday, endless slabs of bacon, the occasional glazed ham, and klobasniky (those bread pockets filled with sausage, cheese, and jalapeño that you know as kolaches—mistakenly). In return, the local community puts the owners' kids through college. These days, almost every meat-based item in my parents' kitchen is sourced from this local Mecca, but not for lack of options. 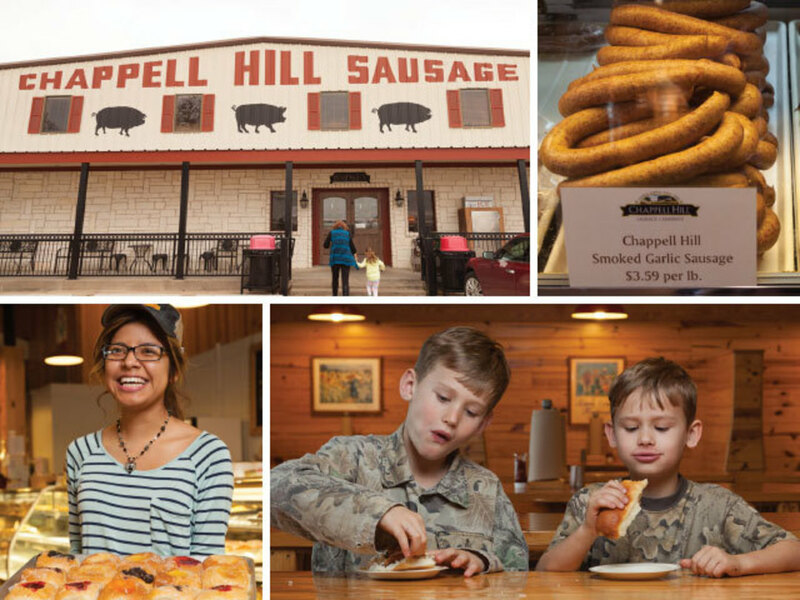 The Chappell Hill Bakery & Deli, another family-owned shop, also specializes in sausage-making, although the real standouts are their sweet pastries filled with fruit (those are kolaches), pastries powerful enough to combat any form of cynicism. 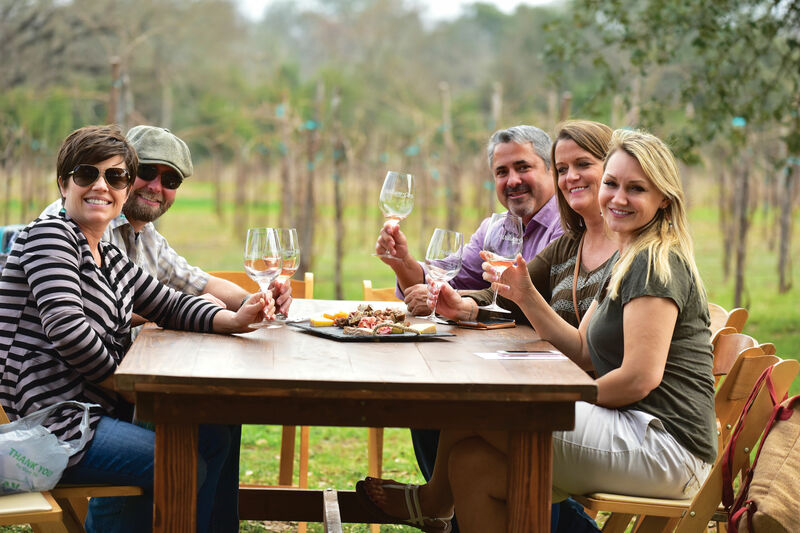 Both shops make great pit stops on the way to the region’s wineries, by the way, of which Texas Star Winery is one of the best. 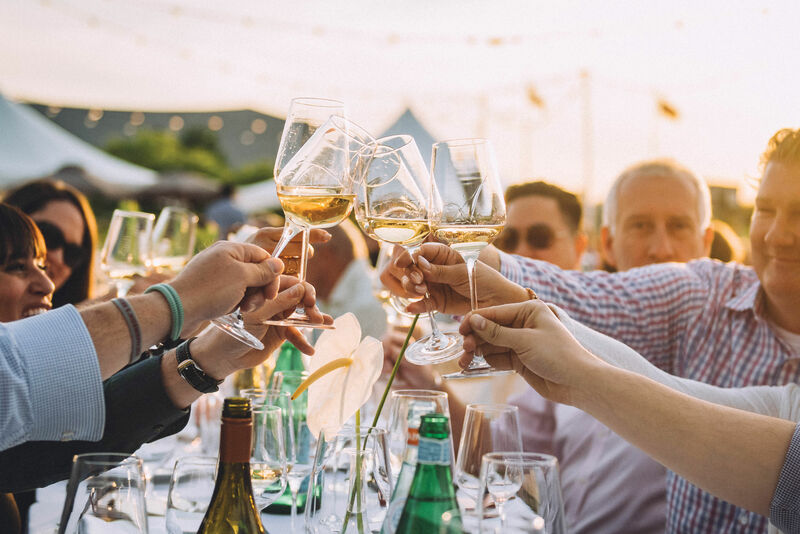 A self-described “country winery” specializing in fruitier fare, there are few pleasures in life that equal a glass of Starlight White amid the bluebonnets. Another idea: wander the Chappell Hill Antiques Mall, the Bluebonnet House & Garden Center, and the Chappell Hill Historical Society Museum, all near the town center. Housed in the former Chappell Hill Female College, the museum tells the story of the town's rapid ascent and equally rapid decline (thanks to a yellow fever outbreak in 1867). The antiques mall, meanwhile, boasts an extensive and incredibly well-organized collection. 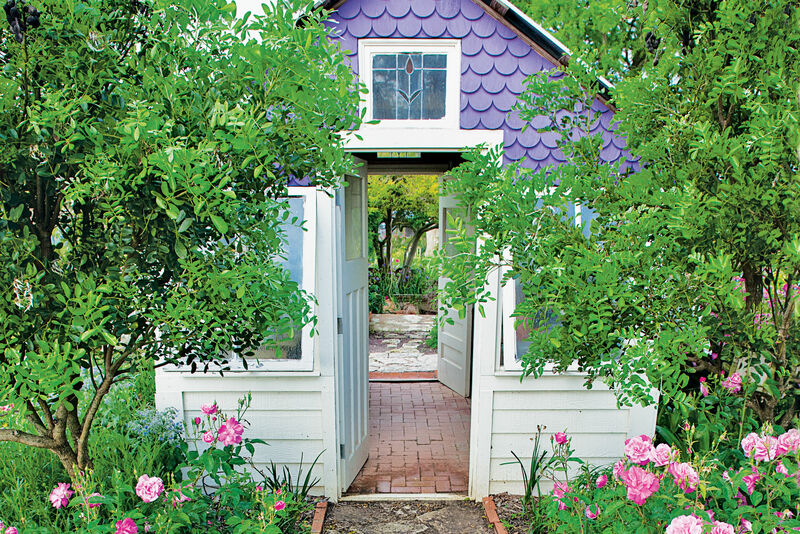 But for sheer novelty, nothing beats the Bluebonnet House, a cool cottage and nursery featuring everything from unusual plants, to ceramics, to candles, to embroidery—plus plenty of critters wandering the grounds. Even cooler, Bobby and Dell Ramey make most of the products in-house. 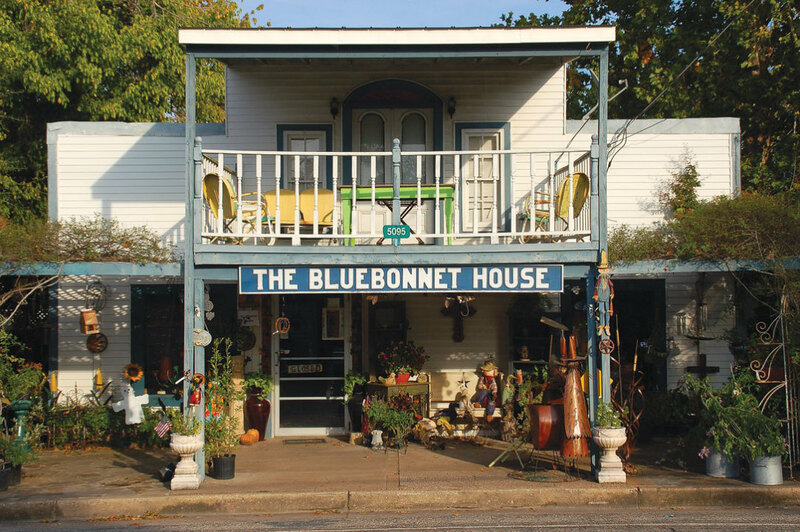 Coolest of all is the month of April, when the state flower comes to spectacular bloom, Chappell Hill holds its annual festival of bluebonnets, and the quaint little shop named for them is at its loveliest. When it comes to lodging, the best place in town is my parents’ spare bedroom, but sadly it is in high demand, usually by me. 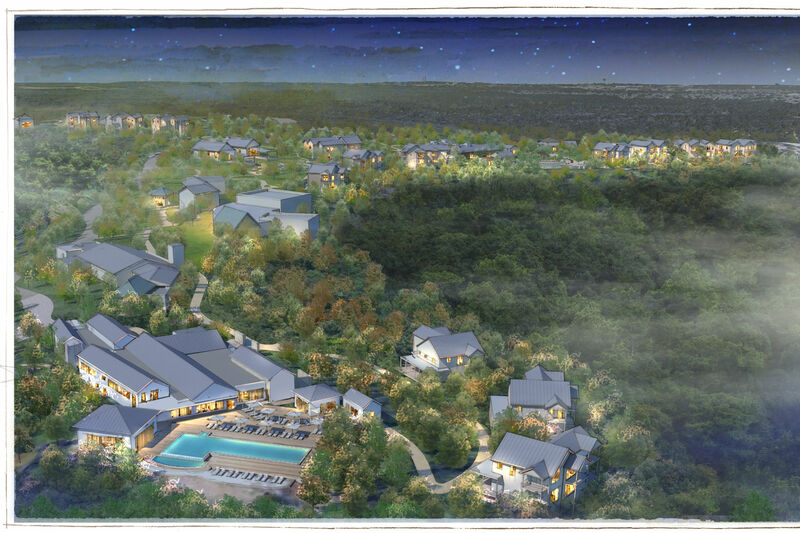 In lieu of that, the Southern Rose Ranch Bed & Breakfast or the Hackberry Hill Cottages—two conveniently located inns—are worthy replacements. And if you haven’t a night to spare, or even an hour, at least stop when you get to the red light on Main Street. Fight the urge to continue to your destination. Instead, turn off the highway and drive down a Chappell Hill road. It doesn’t matter if it’s paved or dirt, although if given a choice, opt for something single-laned. Once it’s so narrow you can smell a fellow driver's aftershave, then, and only then, will you know the real Chappell Hill, a place where nobody hurries to get anywhere else, if only because the streets wouldn’t let them if they tried.